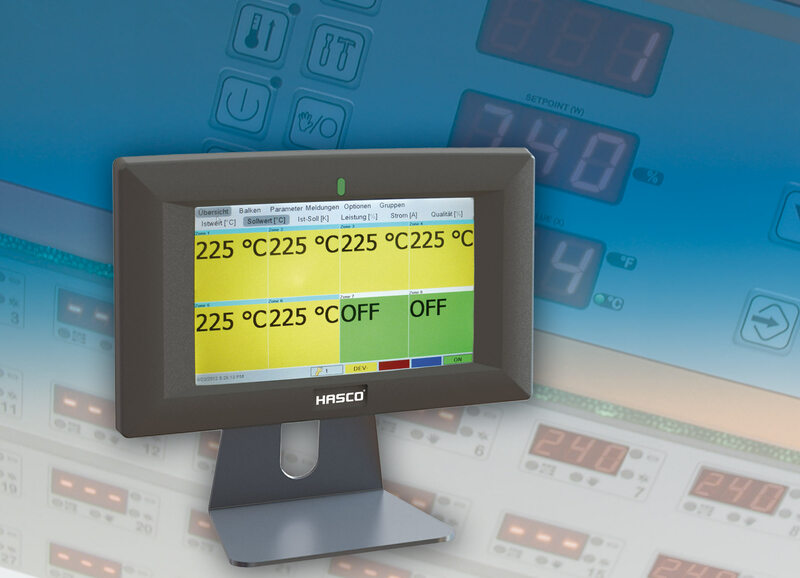 HASCO’s new display unit Z12401/… offers the user inexpensive touch screen operation for the multi-hot-runner control units Z1240/… and Z1246/…. Especially with multi-cavity applications, fast and easy installation of the system is possible in a convenient format. The display unit is best positioned on the operating stand of the injection moulding machine. Connection to the control unit – which can also be positioned elsewhere where space is limited – is made via the supplied interface cable. The overview side adapts automatically to the number of connected control units. The parameters for all zones are displayed in a clearly laid-out manner on this side. The grouping together of control points, settings for set values and intuitive operation permit convenient, user-friendly start-up of the control unit. Settings per zone or group are possible at any time. Through the redundant operability, the values on the control unit or display unit can be altered directly. With warning and alarm messages, the relevant zones are highlighted in colour. The integrated clock allows automatic activation of the connected control units at the intended time. Data exchange or a system update can be performed without problem via USB and Ethernet. The language interface of the display unit can be changed at any time. The combination of multi-hot-runner control units Z1240/…, Z1246/… with the display unit Z12401/… offers the user many advantages with regard to operating comfort during the entire injection moulding process.